A big addition to Donately is the release of a new payment type: direct bank transfer (ACH). Through an integration with Stripe & Plaid, the "micro-deposit" method of bank transfers have been eliminated, and instead we are utilizing the bank's online banking portals to instantly speed up the process. 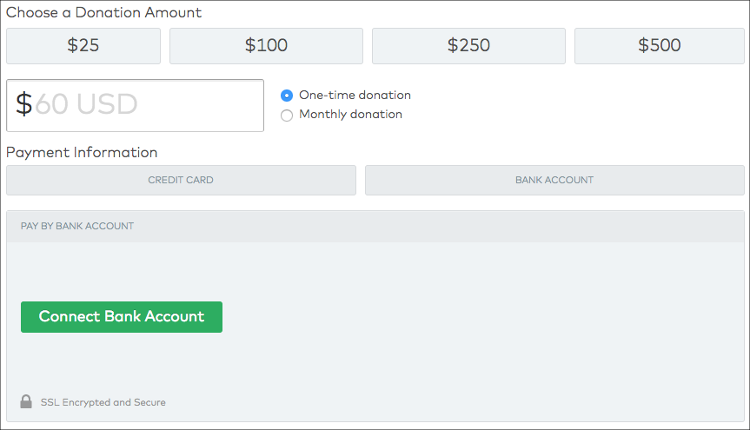 From there, users simply select the bank account from which they wish to donate. No need to confirm micro-deposits or manually enter account & routing numbers. This should drastically cut down the time it takes to process ACH donations and completely eliminate errors from manually entering data. Though Donately's fee doesn't change, Stripe’s transaction fee for ACH donations is just 0.8% and is capped at a maximum of $5. This means any ACH donation over $625 only incurs a Stripe fee of $5, making this a great option for big donations. We know that recurring donations are a vital part of every organization’s overall fundraising efforts. We also know that we’ve needed a solution that lets you know when these donations fail so that your staff can quickly address the issues with the donors and get the plans reactivated. 1. 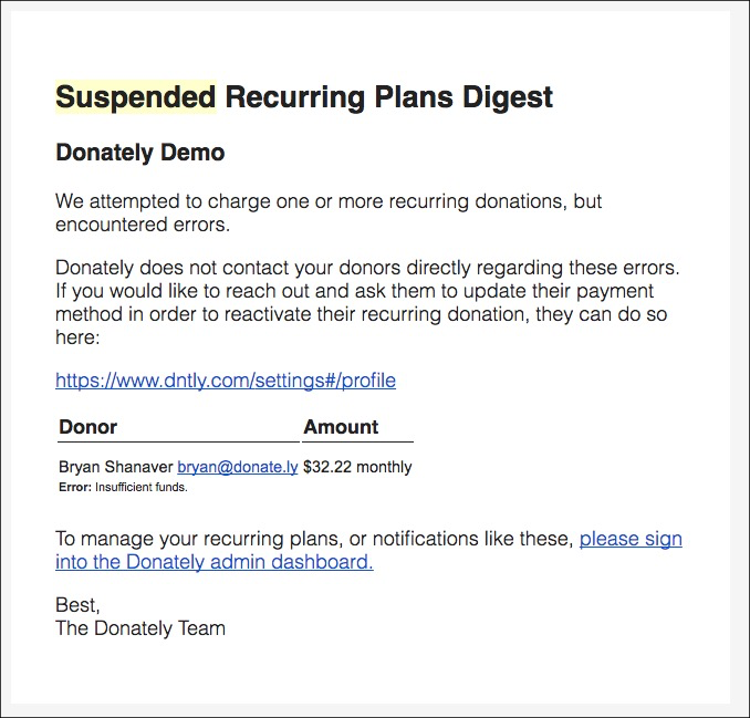 You can sign up for a daily digest email that will notify you when you’ve had recurring donations suspended. For added context, we automatically try any failed recurring donation twice before we switch the status to “Suspended”. When a recurring plan is switched to “Suspended”, it will not run again unless updates are made to the plan. With that in mind, these digest messages are sent in the morning to opted-in admins on accounts who had a donation switched to “Suspended”. This digest will let you know exactly which plan is now suspended so you are able to follow up with that donor directly and get any fixes made as soon as possible. You can subscribe or unsubscribe from these emails from the Admin page on your Donately dashboard. If you’ve reset your password in recent weeks, you may have noticed we’ve introduced stricter requirements. These improved requirements were implemented to improve the security of your account and Donately has a whole. If you haven't yet, we suggest updating your password at your earliest convenience. 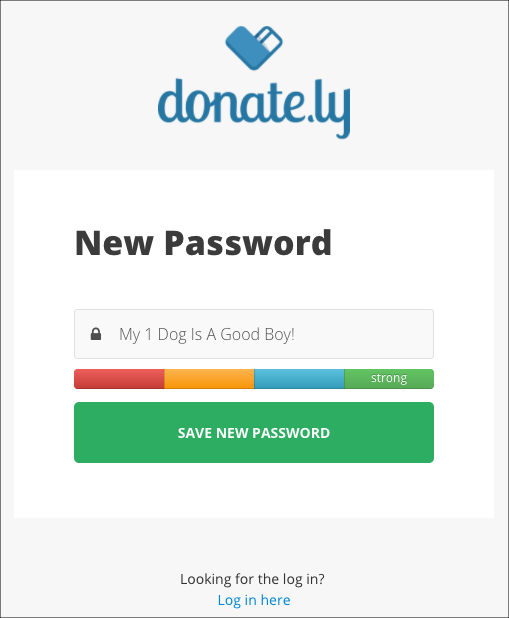 We also recently implemented a meter to help easily gauge the strength of your password. The basic requirements are that the password needs to be at least 8 characters, with at least one letter and number. Beyond that, we suggest a password with multiple words (even a full sentence!) Picking one word and replacing letters with special characters, such as “@” for “A”, don’t help too much with strength, so focus more on whole, random words. That’s it for July! Have any questions? Drop a note to , or chat us from your Donately dashboard..